This article is a guest blogger submission written by Chris and first published at YoungFinanceGuy. If you like what you see, why not subscribe to his RSS feed? Lately, adjustable rate mortgages (ARMs) have continued to receive a lot of bad press. In 2006, there will be approximately $2 billion worth of ARMs coming up for adjustment. In the next two years, a total of $5 billion. Many people talk about the negatives of ARMs, but do not mention why ARMs can turn out be br great loans. I will use myself as an example of someone who is using an ARM to its fullest. I will be the first to admit, ARMs are not for everyone. However, if you fall into the following categories, you may want to consider this type of mortgage. 1: Expect an increase in income? – If you expect your income to increase in the coming months/years, then you might want to consider an ARM. As everyone know ARM’s keep payments low by paying little principle. However, if your income is expected to increase soon, you will have the ability to increase you payments, which will build equity just as fast as a fixed mortgage. 2: Don’t over do it. – People who get in trouble with ARM’s do so because use the product to buy more house than they can afford. If you keep your debt to income ratio in good standing, an ARM should not be a problem. 3: Use the money you save for other investments. – The key with an ARM is to use the money you are not paying on a fixed rate mortgage to invest in other things such as building a stock portfolio, a 401K or an IRA. 4: Don’t ever see the mortgage adjust. – Get a term on the adjustable rate mortgage that is further out in the future than you plan on staying in the property. This way you will never worry about the rate adjusting and will take advantage of the low interest percentage the entire time your in your property. 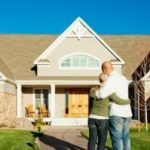 I believe if you intend to stick to these principles when looking into an ARM mortgage, you will find it to be a very friendly and affordable lending instrument. I have an ARM and had one on our last place. There are three major factors involved for us on why an ARM is a good thing. First place we bought with an ARM, 1 bd 500 sq ft condo. Great for a 22 and 24 y.o couple, not good for growing family. So we knew we’d be moving soon enough when we had kids and we got an ARM. Second hubby graduating = way more money. His income went went up about 4-5x more. Okay another reason an arm worked, because we were going to vastly different income levels. Third, location, we now have an ARM because of the two previous reason and our third. We don’t like it where we live and will be moving eventually. So we got a long arm 7/1 last year, and will move eventually back closer to our family (we live 3k miles away). So ARMs work for us because it makes logical sense to lock a rate for a time period where we know we’ll be staying. Our current place is nice but also not really appropriate to having a family. But good for starter place.